Cheeseboy : Grilled Cheese to Go opened recently in the train concourse of South Station. The Boston Globe had an article about the food, and it was only a matter of time before a grilled cheese urge would result in a visit. Alas, the photos of the actual grilled cheese were not saved on my phone as I got overly excited to wolf it down. First impression: the line. It looked long but the owner insisted that it would take only 15 minutes to get our order. He was correct. It took about 10 minutes to get to the register and then 5 minutes to get the sandwich. For commuters on the go - one of the target customers of Cheeseboy - this is probably something to keep in mind if your train is about to leave soon. During non-lunch hours, however, the line is likely to be much shorter. After some contemplation, I ordered The Classic (sliced Italian bread with American cheese) for $2.99 and the Cheddar Delight with bacon and tomato (sliced rye bread with Cheddar cheese) for $5.27. Though tomato soup is available, I did not order it. I ate half of it right away and the other half after getting back to the office to see how well it would travel. The Classic is very basic but also very good. The bread is lightly crisped on the outside and the cheese is a decent thickness to it. Eating the second half back at the office, unsurprisingly, was not nearly as good. The bread had gotten cold and a bit chewy. The Cheddar Delight with bacon and tomato on rye was a bit disappointing. The bacon flavor was a good addition, but the cheese did not have that thick quality to it. With so many different ingredients than my first sandwich, it's hard to know if it was the Cheddar vs American cheese change or the addition of the tomatoes and bacon that made it less thick. 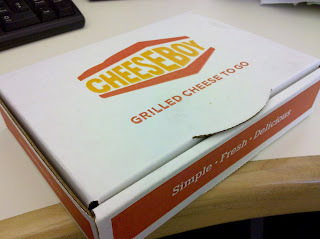 One of the nicer aspects of the "to go" idea is that the sandwiches came in mini pizza box. This prevented the grease of the sandwich from soaking through and helped prevent any unwanted smushing. Also, don't forget to grab some napkins as they will definitely come in handy. 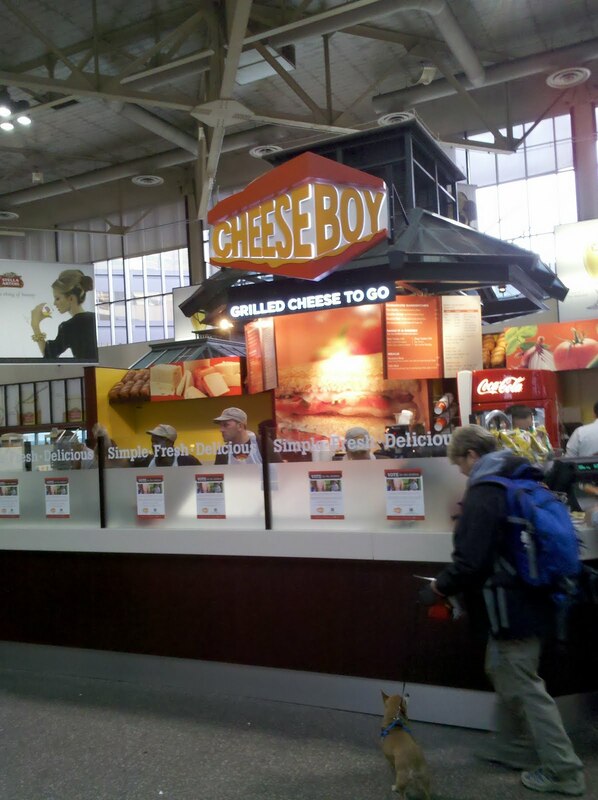 Overall, I'd say Cheeseboy hit the spot. The taste was good and the price is about right. A single sandwich may not be enough for a full meal, but adding tomato soup or chips or getting a second sandwich would suffice. Finding a table at South Station is a bit difficult during lunchtime and grilled cheeses do not travel well, so I'm not sure what the optimal consumption plan is yet. As a footnote, today's profits were being donated to Hole in the Wall. great review. I'm hungry now.